Our Kaiser Buns and Rustic Rolls, with a soft, white crumb and a thin golden crust, arrive just in time for your Memorial Day Weekend BBQ! The Kaiser Buns are perfect for burgers, grilled veggies, or creating your own favorite sandwich. Our Rustic Rolls play well with sausages of all nationalities and make an awesome meatball sandwich. Try making turkey meatballs with the following burger recipe, top with your favorite tomato sauce and there you have it, an awesome turkey meatball sandwich. Toppings: lettuce, tomato, avocado, onion, pickles, and provolone cheese. Add all the ingredients into a bowl and mix by hand or with a mixer using the hook attachment. Form the mixture into patties the size of our Kaiser Buns and brush the patties with olive oil. Cook your patties on a grill over medium-high to high heat, cooking approximately 4 minutes per side, 8 minutes total, until fully cooked. There should be no pink in the middle. You can use a food thermometer to make sure your turkey burgers are at least 165 F prior to serving. Add your cheese during the last minute of cooking to melt it slightly. Optional: Slice the Kaiser Buns and brush the cut side with olive oil and grill until lightly toasted. Build your turkey burger to your liking. We made ours with lettuce, onion, avocado, tomato and provolone cheese. For Turkey Meatballs, try doubling this recipe, form half into turkey burgers and form the other half into turkey meatballs. Line turkey meatballs on a cookie sheet and bake in the oven at 350 degrees for 15-20 minutes or until they are no longer pink in center, and have an internal temperature of 165 F. Slice your Rustic Rolls and pile them up with turkey meatballs, top with tomato sauce and parmesan cheese for delicious meatball sandwiches. 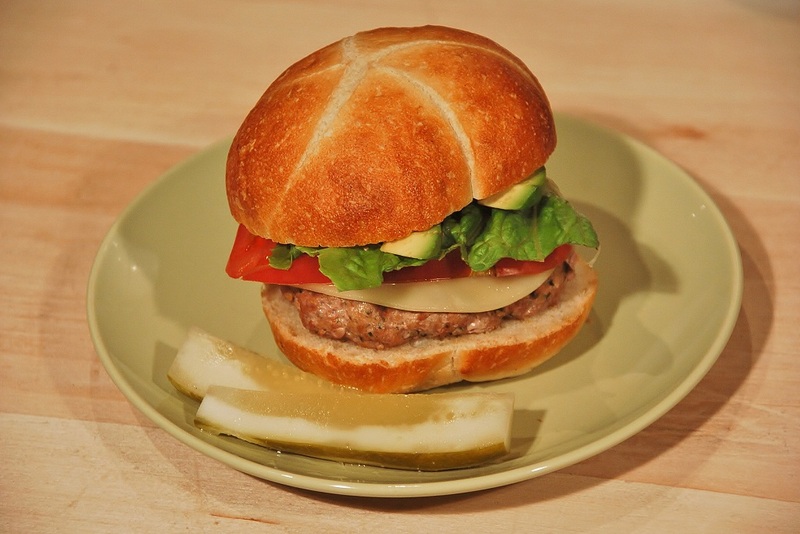 What do you like to create with our Kaiser Buns and Rustic Rolls? Your Most Memorable Meal Contest Look Who’s Coming to Downtown Bellevue!